The 2019 Toyota Avalon Is Way More Interesting, But Will It Sell? Has Toyota done enough to keep the large sedan segment alive? 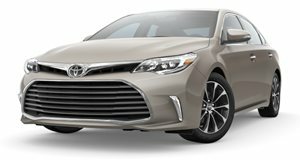 After spending a week with the 2017 Toyota Avalon Hybrid, we feel qualified to say that there is a reason why large sedans are becoming a dying breed. Just like the 2018 Camry, Toyota hopes that this 2019 refresh of the Avalon will convince people that the company is done building boring cars. Right off the bat, the new Avalon looks much more interesting than the car it replaces. The 2019 Avalon will be available in four trims, including a new XSE trim, Touring, XLE and Limited. Hybrid grades include the XLE, Limited, and XSE. Under the hood, the gas-engined Avalon still relies on a 3.5-liter V6. Toyota claims that the V6 will be more powerful and more fuel efficient thanks to direct injection and variable valve timing, but does not quote any specific figures. The Avalon also gets an upgraded eight-speed transmission, which replaces the old six-speed unit. The Avalon Hybrid uses a 2.5-liter Dynamic Force four-cylinder combined with a Toyota Hybrid System II and a 650-volt electric motor that still sends power to a CVT transmission. We'll have to wait to drive this new Avalon, but hopefully these new drivetrains can inject some fun into the Avalon's rather boring demeanor. An Auto Glide Control (AGC) system is new on the Avalon Hybrid. This system allows the car to use engine braking to slow the car down when the driver lifts off the accelerator without touching the brakes. Toyota has also added a Sport drive mode and Sequential Shiftmatic technology for the first time ever on the Avalon Hybrid. This lets drivers shift between six simulated gears through steering-wheel mounted paddle shifters (another first). We doubt that this will do much to turn the Avalon into an exciting driver, but it is nice to see Toyota give the Avalon some interesting features. On the inside, we didn't have too many complaints with the Avalon, but this new model is a nice improvement. The Avalon will continue to use soft-touch materials throughout, which was one of our favorite things about the old model's interior. The materials do change slightly depending on which trim Avalon you buy. Engineered wood trim is found on the XLE, while the Limited features real wood trim. The Touring’s and XSE’s cabin use aluminum trim and a mix of perforated suede wraps on all seating in Touring and XSE trims. Softex seats within XLE also receive artistic vertical stitching. The Limited trim adds a quilt pattern, special perforation, and two-color stitches. Toyota has also made improvements to the infotainment system, which is now shown on a nine-inch touchscreen. The infotainment system is powered by Entune 3.0, which finally comes with Apple Car Play as standard. Sadly, Android Auto is not present. This system also features availability of third-party apps such as the Connected Navigation Scout GPS Link App. The system will also have safety connected services that are powered by Wi-Fi from Verizon with up to 2GB within 6 months. Toyota has even improved how this system functions. The 9-inch screen is now capacitive, which means that it can be pinched and flicked like a smartphone. There is also a 10-inch Head-Up Display (HUD), which Toyota says is the largest in the segment. A JBL performance audio system is standard on Limited and Touring grades and is available on XLE and XSE grades. Toyota has also realized that people love to bring their technology along for the ride, and have given the Avalon slide-open eBin containing a 12-volt plug and a standard wireless Qi mobile device charger. The cabin of the Avalon also features five USB ports so that the whole family can charge their devices. Pricing and availability has not been announced, but the car will be built at Toyota's US factory in Georgetown, Kentucky, so expect it to arrive in showrooms later this year.